The flag of Italy (1797) was modeled after the flag of France. It was originally the flag of the Cisalpine Republic, and the green came from the uniforms of the army of Milan. The flag of Brazil (1889). The green color was inherited from the flag of the Empire of Brazil, where it represented the color of the House of Braganza. The flag of Ireland (1919). The green represents the culture and traditions of Gaelic Ireland. 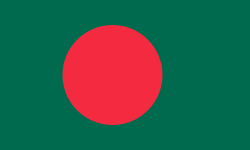 The flag of India (1947). The green has been said at different times to represent the Muslim community of India, hope, or prosperity. 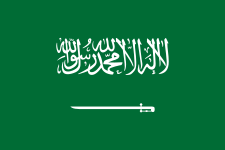 The Flag of Saudi Arabia (1973) has the green color of Islam. 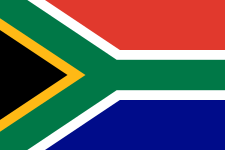 The inscription in Arabic says: There is no God but Allah, and Mohammed is his Prophet,"
The flag of South Africa (1994) includes green, yellow and black, the colors of the African National Congress. The former flag of Libya (1977–2011) was the only monochromatic flag in the world, with no design or details. The flag of Nigeria (1960). The green represents the forests and natural wealth of the country. The flag of Pakistan (1947). The green part represents the Muslim majority of the country. ↑ The sRGB values are taken by converting the NCS color 2060-G using the "NCS Navigator" tool at the NCS website.